Merging (also called piping) allows you to take text from one source and merge or pipe it into another source. 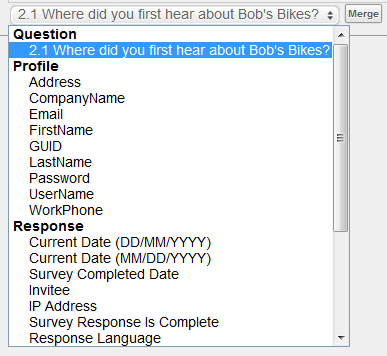 Text can be merged from previous questions, user profiles, or response properties (such as the survey date or language). 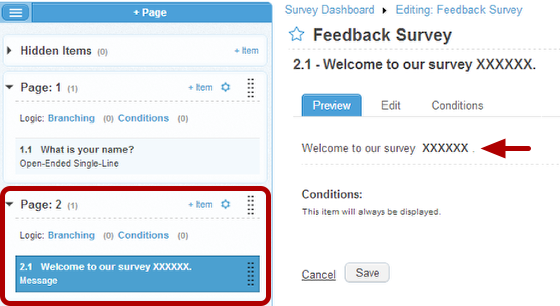 Text can be merged into survey questions, survey answer choices, survey message items, or email alerts/invitations. 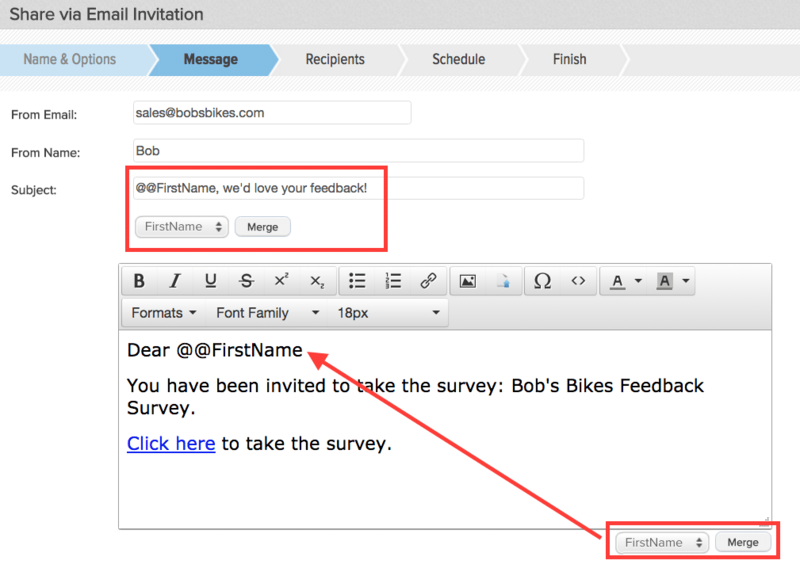 This guide demonstrates a few different ways in which you can use the Text Merge feature to personalize survey and email invitation content. Questions: Respondents’ answers to previous survey items (*note that the question you are merging must be on a previous page). Profile Properties: Profile property attributes such as First Name, Last Name, and Email Address. 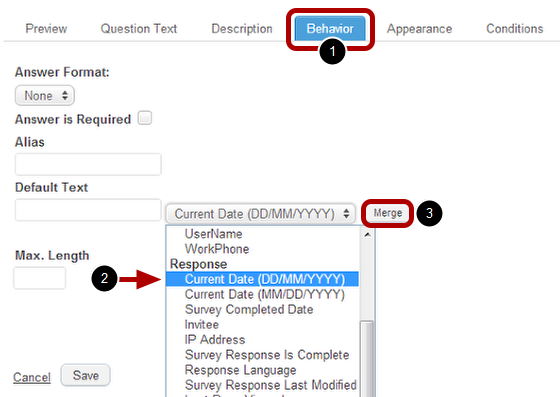 Response Properties: Information related to the individual survey response, such as IP address, Current Date, Language, etc. In this example, we will merge a respondent’s answer to the question “What is your name?” into the text of a message item on the next page. The second page of the survey contains a Message Item. The text in this item reads: “Welcome to our survey XXXXX.” We will apply a merging code here to replace XXXXX. In a live survey, the merging code will automatically populate with the answer to “What is your name?”, entered on the previous page. 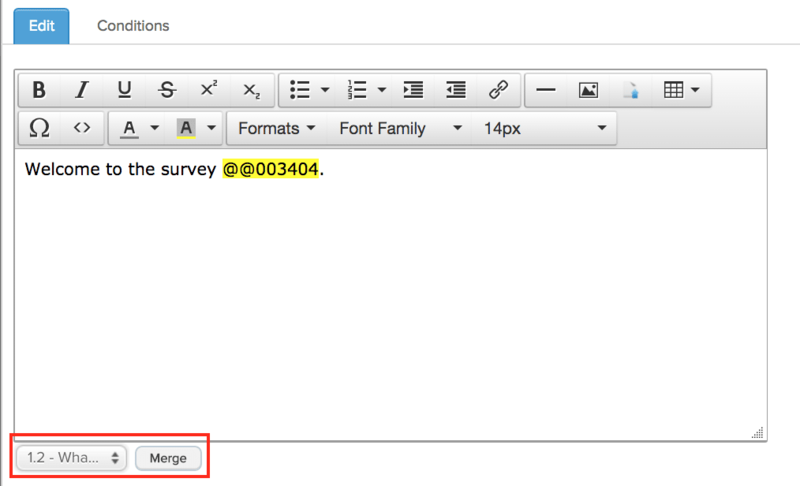 NOTE: When merging text from a previous question, the source for the merged text must be located on a previous page. Select Survey Item that you want to merge text into. Open the Edit tab if you are in a Message Item. Open the Question Text or tab if you are in a Question Item. Click in the text box where you wish to merge in the text. From the Merge Drop-Down, select a source. In this example, our source is the answer to a previous question: “What is your name?”. The Source Value Code is a place-holder for the source value you selected from the merge drop-down menu. Only the survey creator/editor will see this code. This code will be replaced with the source value (e.g. Jessica) when the survey is taken. NOTE: Always test your survey to make sure all merging is working properly before distributing your survey. Open Ended Single-Line and Multi-Line Text Items allow you to insert default text into the answer field, which is pre-populated when a respondent opens the survey. The default text can then be left alone, deleted, or modified by the respondent. Merging can be used to insert a source value as the default text of an Open Ended Text Item. In this example, we will use a Response Property as the source value. Response properties are details about a survey response, such as a respondent’s IP address, response language, when the survey was started, etc. From the merge drop-down select one of the “Current Date” options. Click the Merge button to insert the Source Value Code (@@CurrentDate…). Always test your merging logic before making a survey live to respondents. When a respondent lands on the page with your merging logic, they should see the current date in the format you specified in place of the source value code that was inserted in the Survey Editor. The source value code has automatically filled in with the current date. User attributes (user profile properties) of known Checkbox users can be merged into the subject line or message body of email invitations. From the Invitation Wizard, select in the message body text box where you wish to merge text. Next, use the merge drop-down under either the subject line or message field to select a User Attribute. Finally, click the Merge button to insert the Source Value Code. In the above example, we wish to merge in a Checkbox registered user’s first name into the salutation. NOTE: User attributes can only be used as the source for merging when a recipient has a user profile within your account’s User Manager. If you are sending an email invitation to an email list (no user attributes captured), there is no user data to merge into your invitation.